There is nothing quite like the chill of an evening spent outdoors and the glimmer of a starry sky to get you motivated to go faster and farther than you have ever been. When it comes to choosing the right sleep system for maximum comfort and protection, there are a wide variety of features you need to take into consideration. Discerning backpackers and thru-hikers know that the ultimate outdoor experience comes down to the weight of your pack and a good night’s sleep. Set yourself up for success by joining us as we review Nemo’s Sonic Down sleeping bag. In this review, we will discuss the benefits this sleep system has to offer as well as some of the considerations you should make before deciding to invest. Thermo Gills – regulate the warmth of the bag on milder nights by as much as 20°F/11°C without letting cold drafts inside. As with any product you purchase in-store or online, deciding whether a product is right for you depends on the type of trips you take most often as well as your requirements for comfort, resistance to elements, and overall value. As outdoor enthusiasts ourselves, we understand how important it is to find the most versatile sleeping bag for your outdoor adventures while remaining true to your wallet. When in doubt, we recommend making a prioritized list for all the features you would like as well as a list for all the features you absolutely need. Using this method, you can safely determine what features you can compromise on without giving up too many of the design details you would really appreciate having in the wilderness. Resistance to temperature is paramount in choosing the best bag for your upcoming expedition. Sleeping bags with low temperature ratings are notoriously heavier due to higher quality materials. However, you can easily find low-temperature sleeping bags that save on weight in other areas. Another major factor for experienced outdoorsmen is the sleeping bag’s shape. Most sleeping bags on the market are available in either the mummy shape or a semi-rectangular shape. Pinpoint shoulder and hip girth specifications with any bag you’re researching to determine whether one is roomier than the other. Lastly, insulation can be another determining factor in the journey to find the best solution for you. Both synthetic and down fill have their advantages, but water resistance, warmth, compressibility, weight, and price are crucial to making the right choice. When cold weather is keeping most hikers out of the mountains, you can dare to go farther and higher when you have the Sonic Down sleeping bag by your side. It is finally time to review some of the key characteristics of the Sonic Down sleeping bag, so you have a reliable outset for additional research. Here are several of the most essential features to consider with the Sonic Down or any sleeping bag. When packed down for travel by foot or any other means, the Sonic Down compresses to roughly 18 by nine inches in diameter, or six-and-a-half liters in volume. For ultralight hikers or thru-hikers who count on cutting weight to keep the pace for extended periods of time, the sizes of their packed sleeping bags can make all the difference. We sleep approximately a third of our lives, so it should come as no surprise that you will require an impressive amount of sleep to counterbalance the energy exerted throughout the day, the loss of calories due to exercise, and the gain from proteins such as fish or jerky as well as grains and other essential nutrients. Your decision to buy a sleeping bag is a smart one, especially if you intend on spending a bit of time outdoors. Being prepared is the first step in responsible endeavoring, and we hope that our review helps you in the attempt to determine whether the Sonic Down is right for you. Every top-of-the-line sleeping bag offers a unique set of design features that are of more value to some than they are to others. The Sonic Down sleep system is one such product that offers a few unique features you may find worth the investment. For starters, this sleeping bag boasts Thermo Gills that allow you to regulate the warmth factor on mild nights by as much as 20°F, without letting cold drafts inside. Another cool feature of the Sonic Down is its unique stretch stitching construction at the knees. This bonus supports your sleeping bag’s shape, thermal efficacy, and loft for long-lasting comfort and quality, while offering enhanced volume so you can sleep on your side or with your knees bent. This innovation can also be found in the “toester box,” which diminishes cold spots by charting areas of high compression and improving insulation loft for a full night’s sleep. Either of these original features allow campers, hikers, and backpackers of all kinds and experience levels to test the limits of sleeping outside. Whether or not these unique features are worth the cost is entirely up to you. This sleeping bag is available in regular and long styles to accommodate a wide range of body types and user preferences. The hip circumference ranges from 58 to 63 inches in size. The max user height ranges from six feet to six feet and six inches. The foot circumference for both sizes is 56 inches, providing a little bit of wiggle room to create a strategic ventilation choice with the full-length zipper at the footbox. The Sonic Down is a traditional mummy bag, so it may not be the best choice for large hikers that require a little extra space. Mummy bags are specially designed to retain heat while saving on packed space. Although there are sleeping bags designed specifically for women in mind, the Sonic Down is of a unisex design and can accommodate the average backpacker. This classic mummy sleeping bag offers a 20-denier ripstop nylon shell named OSMO™ DT, Nemo’s proprietary waterproof fabric. Better yet, you also gain a polyurethane coating that gives you the advantage in damp environments while remaining flexible in sleep and in packing. This proprietary membrane comprises featherweight Japanese fibers that are distinguished for tear strength and lasting durability. Sleeping bags with durable water repellants are preferred by many because they are so versatile, but check carefully as to whether the shell is nonporous. The added protection may very well reduce ventilation, which could make for a restless night in muggier settings. Most of the sleeping bags in this performance class offer three-quarter zippers to save on materials as well as heat retention. The Sonic Down, on the other hand, comes with a full-length center zipper that offers supreme accessibility without compromising on warmth. Inhabitants can make a quick getaway or adjustment without disrupting the thermal efficiency of their sleeping bags. The only downside to choosing the Sonic Down is that it is only available in left-handed designs at this time. The fill power of goose down is a dependable measure of two essential features. When balancing warmth to weight in your decision to purchase the Sonic Down, you should realistically invest in a sleep system with no greater (or lower, truly) a temperature rating than you explicitly need. If you choose a 15°F sleeping bag when you typically take trips to mild climates or during the warmer months, you may find that you have overstepped the essential minimum of your needs. Additional benefits or better-quality materials often equate to higher price points. Another key factor of the Sonic Down is its compressibility, which is a term that refers to the decrease of volume made possible by the material. Down fill is naturally more compressible than its synthetic alternative. The Sonic Down boasts duck down, which offers ultimate loft and warmth at minimal weight. Those backpackers and trail seekers who dare to venture into high elevations for the breathtaking views and displays of nature or areas known for plummeting night temperatures in the north or the desert require sleeping bags that can paradoxically trap heat when and where it counts while allowing ventilation for valuable airflow. The Sonic Down offers an impressive EN lower limit of approximately 6°F and an EN comfort rating of approximately 27°F. We believe that this sleep system is the best choice for hikes and trips with a predicted high of 40°F. Any warmer, and you may find the low temperature rating to be uncomfortable for muggy nights. At a price point of approximately $429.95 – $559.95, the Sonic Down delivers a decent value. Paying close to half a grand for a sleeping bag may seem a hefty investment for beginning backpackers and casual outdoor enthusiasts, but adequate rest and safety are two adventure details you cannot overlook. Another somewhat practical feature of the Sonic Down is that it comes complete with stuff and storage sacks. Most sleeping bags on the market include these accessories, but they are excellent features to have nonetheless. One of the most important steps in your journey to find the best sleep solution for your needs is comparing products and their unique features. We took the liberty of gathering some close competitors of the Sonic Down in the hope that they are worthy alternatives with the benefits you want and need. We set out to explore some of the best sleeping bags in the business made by Western Mountaineering and Big Agnes. 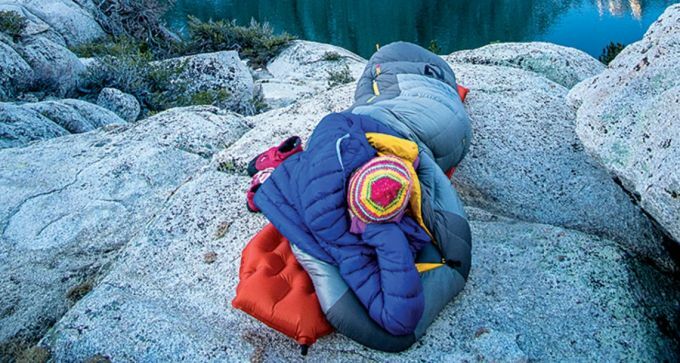 Each of these sleeping bags is comparable in cost, temperature resistance, and design. At an approximate price of $584.95 – $605.00, the Western Mountaineering Badger MF sleeping bag is an ideal alternative to the Sonic Down and costs just a bit more for an array of beneficial features. This competing sleep system boasts a temperature rating of 15ºF, just like the Sonic Down. Both sleeping bags offer 850 fill power for supreme comfort, but this other 15ºF sleeping bag is available in your choice of zipper orientation. Interestingly, the Badger MF compresses down to an average weight of two pounds and eight ounces, whereas our reviewed sleeping bag ranges from approximately two pounds and six ounces to two pounds and nine ounces in total weight. Unlike our reviewed product, the Badger MF does not offer any technical degree of water resistance or protective coating. If you tend to explore or hike in wetter climates or during months that are known for inclement weather, the Sonic Down offers a better value than the Badger MF. Western Mountaineering relies purely on the quality and craftsmanship found in each bag they produce. Furthermore, synthetic down may be more dependable for outdoorsmen heading to wet climates. The Big Agnes Mystic SL 15 Degree Down sleeping Bag is another choice alternative to the Sonic Down, at approximately $349.96 – $539.95. The Mystic SL features a fully integrated pad sleeve to prevent rolling in the middle of the night, which is great for backpackers that regularly sleep very warm or very cold. Unlike the Sonic Down, this competitor comes in a rectangular shape, which offers more room in the foot box and shoulder areas for stowing clothes and other on-the-go accessories to improve the experience. As discussed, most of the top sleeping bags in the field come with a storage sack of some kind. The Mystic SL includes a recycled mesh storage sack and a stuff sack for your convenience. There are also built-in pillow pockets to accommodate your favorite pillow or one of the exclusive Big Agnes pillows. The Mystic SL also includes a 70-inch YKK #5 zipper that comes in either left- or right-hand designs. If you are camping with friends or loved ones, you can even join sleeping bags to create a large sleeping area on warm nights by mating their left and right models together. The Western Mountaineering Versalite Sleeping Bag costs approximately $558.99 – $589.95 and is another slightly more expensive sleeping bag that would serve you well in the backcountry. With a temperature rating of 10ºF, you gain an extra five degrees to push your camping options to the next level. Another advantage to making a heftier investment is that the Versalite weighs merely two pounds and would be an ideal option for anyone needing an ultralight solution with down fill for all-night comfort. Although the Sonic Down does include an internal draft collar, the Versalite boasts a full collar that is cut from a larger piece of fabric than the exterior, which creates a loose down-filled fabric that hugs your head for maximum comfort and locked warmth. Furthermore, the Versalite sleeping bag is available in both left- and right-hand orientation choices, so you are not restricted to crossing your body to exit your sleep system. The major advantage to choosing the Sonic Down over the Versalite is that you have the option to gain up to 78 inches room as opposed to only 72 inches of height. Whether you are on the hunt for a reliable sleeping bag for your winter desert camping trip or you are headed on a summer alpine backpacking expedition, choosing the right equipment is imperative to enjoying the overall experience. Your sleeping bag is one of the only barriers between you, the ground, the bugs, the cold, and a host of other impediments. Unless you intend on towing a tent along with you, which may not be feasible for hikers with deadlines or records to beat, the sleeping bag you choose can come between you and the proportionate amount of rest you need to remain healthy and balanced while far away from home. Some of the most important characteristics for you to consider include fill power, temperature rating, water resistance, and shape. By making a brief wish list, you can more easily determine which key components you are willing to sacrifice in order to gain other great benefits as well as staying within your budget. We understand how daunting shopping for outdoor gear and accessories can be. Luckily, we are here to help. Now that we’ve covered the key factors in the decision to buy a top-rated sleeping bag, we hope that we helped you get one step closer so making the smartest investment. Your safety is most important, and adventure awaits. Nemo’s Sonic Down Sleeping Bag is best suited to backpacking. At a medium weight of over two pounds, the down fill benefits and added features may not be worth the extra weight added to your pack. With practical features that will come in handy in a variety of landscapes and elements, the Sonic Down is a dependable sleeping bag that performs well against its direct competitors. The comfort rating is perfect for light winter hiking, yet anything colder than 15.6°F requires additional protection. At an approximate cost of $429.95 – $559.95, the Sonic Down is a worthwhile investment for anyone who takes sleeping outdoors seriously and needs a reliable sleep system for consistent use. Have you owned or used this sleeping bag before? If so, we would appreciate if you shared your experience with us in the comments!